Between the years 1919-1933 Germany was not politically and economically balanced. Still this period of time included a major developing of arts and science in the republic, making Berlin the cultural center of all Europe at the time. The visual, written and recordings of these years still act as a stimulus and a challenge because they have the power to appeal to nostalgia and remembering the flourish of arts. The history of the Republic can be divided in three main areas: The Years of Turmoil (1919-1923), The Stresemann Era (1924-1929) and The Collapse of Weimar (1930-1933). The Weimar Republic faced many problems. Perhaps the greatest danger was ‘the weakness within’ – the constitution gave the President, the states and the army too much power, whilst proportional voting meant that the Reichstag was divided and weak. 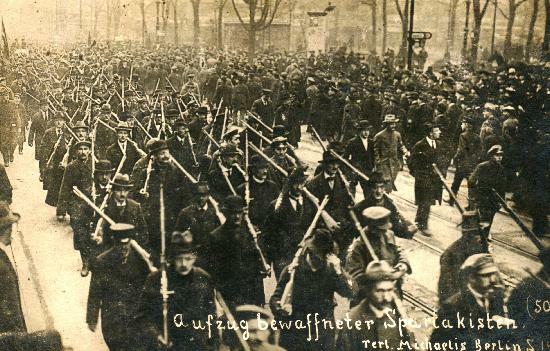 In 1919-23, extremists on both the Left (the Spartacist revolt) and the Right (the Kapp Putsch) tried to overthrow the government. The Spartacus League was a Marxist revolutionary movement organized during the World War 1. It was founded by Karl Liebknecht , Rosa Luxemburg, Clara Zetkin and others. They seized building throughout the city and the government fled it. The worst crisis occurred in 1923, when the French invaded to try to force Germany to pay reparations. This led to hyperinflation and a number of rebellions (particularly Hitler’s Munich Putsch).During the dark days of 1923, Gustav Stresemann was appointed chancellor and his policies would help to transform the fortunes of Weimar. He had been a strong supporter of Germany’s involvement in World War I and advocated unrestricted submarine warfare as the only means to defeat Britain. At first, Stresemann felt no loyalty to the new Weimar Republic and he opposed the Treaty of Versailles. He set up his own party the German People’s Party (DVP). However his views developed and he advocated a great coalition from the SPD to the DVP to consolidate democracy against the extremes of left and right. He became Chancellor in August 1923. His government lasted a hundred days until November 1923 but he remained as foreign minister in successive coalitions until his death in October 1929. As Chancellor he took the crucial step of ceasing financial support to the general strike in the Ruhr. He introduced a new and stable currency (the Rentenmark) that ended the hyper-inflation. He also crushed a communist revolt in Saxony and faced down the threat from Hitler in Bavaria.In 1925 he took the initiative that led to the Locarno Pact. Under this agreement Germany recognised her Western frontiers as final and agreed to use peaceful means to ensure revision of her frontiers in the east. Stresemann was a German nationalist and was not prepared to give up what he saw as legitimate demands for the return of Danzig and the northern half of the Polish Corridor. In September 1926 Germany joined the League of Nations with a permanent seat on the Council in recognition of her status as a great power. As part of this policy of co-operation, the first of the three Rhineland zones which had been placed under Allied military occupation by the Treaty of Versailles were evacuated in 1926. In 1927 the Inter-Allied Control Commission to supervise German disarmament was withdrawn. The Young Plan agreed in 1929 greatly reduced German reparations to a figure of £2 billion and Repayments were to be made over a period of 59 years. Stresemann also won complete allied evacuation of the Rhineland by June 1930 (five years ahead of schedule). It is hardly surprising that when he died of a stroke in October 1929 at the early age of fifty-one Stresemann’s reputation stood very high. He had also become a focus for hopes of European peace. Hitler is reported to have remarked that in Stresemann’s position “he could not have achieved more”. The cultural achievements in Weimar Germany were the start of serious town-planning, the Neue Sachlichkeit exhibition at Mannheim, the Bauhaus`s move to Dessau, Brecht`s arrival to work in Berlin and the founding of the Buchergilde Gutenberg socialist book club, together lifted the modern movement on to a new level where some of its most exciting works could now be produced.